La Jolla Cove Beach in San Diego CA, is a charming beach in the heart of the scenic La Jolla Coast Walk. If you want to see the best sights in San Diego, a day in La Jolla community of San Diego, Cal. has something for everyone. 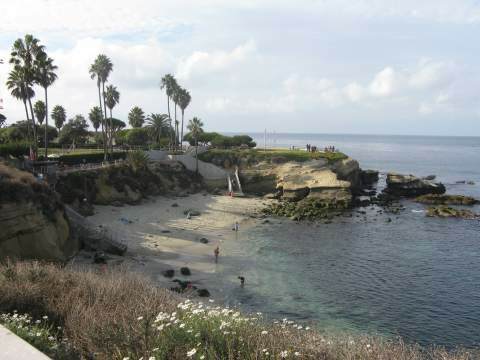 The beautiful La Jolla Cove is a small sandy beach nestled between the sandstone cliffs in La Jolla, next to the Ellen Browning Scripps Park and a short distance from the La Jolla Children's Pool and the La Jolla Sea Caves. The La Jolla Cove beach itself is quite small, but the views are spectacular, and the water has great visibility and an abundance of marine life in San Diego Underwater Park Ecological Reserve in La Jolla Bay. There are some interesting rock formations that have suffered from San Diego beach erosion over the years. This SD beach is a favorite for open water swimmers, snorkelers, and scuba divers as they enter or exit the waters of La Jolla Bay. 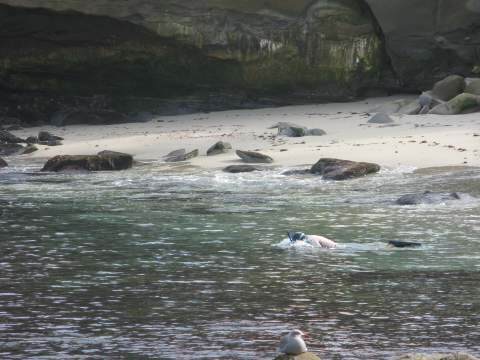 If you want to snorkel La Jolla, this is the place to go. For the rest of us, tourists and locals, the setting is perfect, the views spectacular, and this is a must see stop along the La Jolla Attractions. There is so much to see, including brown pelicans, harbor seals, and scenic views. Parking: Limited free parking along Coast Blvd, which is easier to find after you pass La Jolla Cove. You can usually find parking on a side street up the hill, or in one of the pay parking lots. Getting There: Short walk to the beach from parking areas. The views are spectacular so you won't mind the walk. Things to Do: Walking, jogging, roller blading, sunbathing, swim to La Jolla Shores, snorkel La Jolla, scuba diving, walk along the beautiful La Jolla Coast Walk to the La Jolla Children's Pool, photograph the seals, hunt for shells at nearby Shell Beach. Things to See: Seals, birds, open water swimmers, snorkelers, La Jolla Caves, Cave Store, sunset over the Pacific Ocean. Facilities: At nearby Ellen Browning Scripps Park there are restrooms, showers, changing rooms, trash cans, and plenty of grassy area for a picnic. 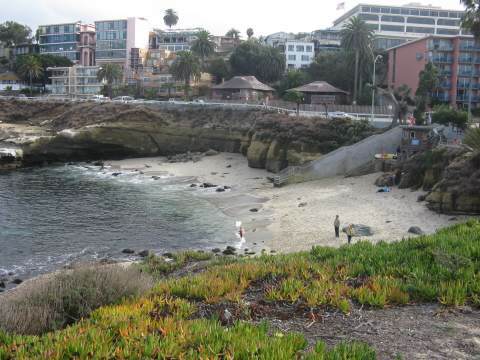 Services: Many restaurants, bars, and hotels nearby in scenic downtown La Jolla. High Tide Access: This small beach gets even smaller at high tide, which doesn't matter if you are here to swim in the clear water or enjoy the scenic La Jolla coast walk. Lifeguard: Lifeguards all year around. Things NOT to Do: No surfing, no bodyboarding, no fishing, no beach fires, no flotation devices, no alcohol, no glass containers, no smoking, no littering, no disturbing noise, no overnight sleeping, camping or parking. Disability Access: Some disabled parking and access to the fantastic views along the Coast Boulevard, but you can only reach La Jolla Cove beach by descending steep steps. Hazards: Rip currents, sharp and slippery rocks.